Horse had retreated to his favourite rocking chair in a corner of the room. “Ouch!” exclaimed Little Nani again. It was pretty clear by now to Little Nani that she wasn’t going to have any fun that day. She thought that the rain was boring and, folding her arms with an angry look, she sat down in a corner. Cinta Garcia de la Rosa is a Spanish writer who has loved the written word since she discovered she was able to read books at age 5. Since then, she has become a bookworm and reads around 100 books every year. She also writes, every day, compulsively, even in the middle of the night. You cannot control when inspiration hits you, can you? She writes in English because she is convinced that in a previous life she was British, so writing in English feels more natural to her than writing in her native language. Yes, she is crazy like that. 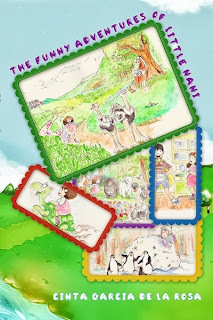 Cinta Garcia is the author of "The Funny Adventures of Little Nani", a collection of short stories for children, and "A Foreigner in London", a short story published on Smashwords.